We've designed a unique, tracking affiliate panel intergrating the features our clients needed and requested. Our affiliate control panel is easy to use. It accurately detects clicks, signups, if a potential refered client leaves our website and comes back later, you will still get the sale. Statistics we provide are very helpful to see where your traffic comes fromand what services they are buying. Simply register an account with us then visit our affiliates section to join, instant approval. Use your earnings from your referals as credit for invoices and services we provide or get paid via PayPal. 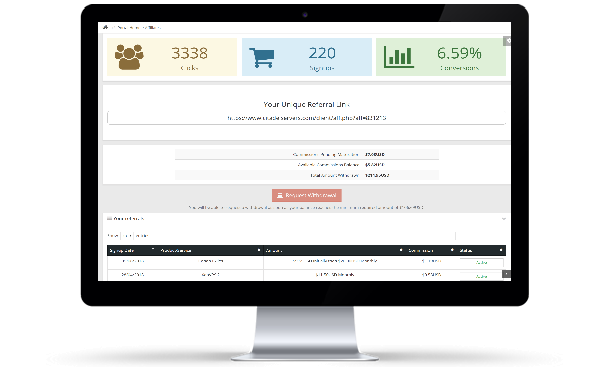 You will have full control and view over your own referals through our affiliate control panel as well as full statistics. Our payments are secure, details never touch our servers, allowing your refered clients to pay in confidence. Are you a new affiliate? Join our affiliate program here!